CENTURION MEDICAL CORPORATION has been designing and manufacturing Pulsated Electro-Magnetic Field Therapy (PEMF) equipment for over 25 years. As an industry leader, Centurion’s Products have been designed to fill the market needs of clinics and hospitals, as well as the ever-expanding home market in Healthcare. To ensure customer safety and equipment reliability, great care has been taken to design all of the Centurion equipment to the highest available standards. Full quality control and complete product testing are standard in our manufacturing process. Every unit produced is calibrated precisely and tested to meet exact criteria to guarantee trouble free operation. Magnetic Field Therapy is a modality that has been evolving for nearly 100 years. Over the last thirty years, serious research has been carried out to investigate and substantiate the claims that have been made regarding the therapy. Now, through research being conducted worldwide by colleges, clinics, and technicians, as well as thousands of anecdotal reports, we have arrived at what we feel to be the optimum frequency, time and intensity levels for this modality. The practical application of pulsating magnetic fields is achieved through the basic principles of electromagnetism. That is, if a current is passed through a conductor, a magnetic field will be set up in that conductor that is perpendicular to the conductor and, if combined with other conductors, as is found in a coil structure, these fields are additive. By controlling the amount of current that is directed toward a particular coil structure, we can effectively control the field that will be induced onto the coil. By further controlling the frequency of the current directed to the coil, we can create a pulsing action that will continuously turn the field on and off. The pulse frequencies are preset on the EZY-System to 4 intervals ranging from 2-30 Hertz. Session time length may be varied in 10-minute increments ranging from 20-60 minutes (the normal maximum time per session). This manual will give you a much better understanding of the Centurion EZY-System, how to properly use the therapy to achieve maximum benefits, and how to take care of the equipment so that you can continue to enjoy the benefits for years to come. EXPLAINING MAGNETIC FIELD THERAPY Centurion Pulsating Magnetic Fields (PMF) therapy is very efficient and simple to use. From field experience, it has been found that pulsating magnetic fields can aid in the reduction of swelling and the stimulation of tissue. It is particularly beneficial as an aid in control of chronic pain and the management of musculoskeletal conditions. Centurion PEMF works by influencing the body either generally or locally with a magnetic field packed in paramagnetic impulse bundles. 2 Magnetic fields cannot be absorbed, and simultaneously permeate all target cells when delivered in the Centurion PMF format. Human and animal organisms consist of a large number of cells which function electrically (See Figure #18). Electric potential has a strong relationship to cellular viability. Our cells have a basic (or rest) potential that is necessary for normal cellular metabolism. The oxygen utilization of the cell, key to cellular rest potential, is proportional to the ion exchange occurring at the cell membrane. The ion exchange can be positively influenced by pulsating magnetic fields. Ionization in a Cell 2 We often differentiate between paramagnetic substances, in which a bundling or a concentration of magnetic field lines occur, and diamagnetic substances, in which a decentralization of the field lines results. The only magnetic therapy with a proven, clinical track record uses pulsating, paramagnetic energy. Static magnetic sessions using diamagnetic substances, commonly found in an ordinary fridge magnet, have minimal or no proven effectiveness in controlling chronic pain or treating musculoskeletal conditions. PEMF (pulsed electromagnetic field) therapy is fast gaining ground as an alternative therapy for various types of medical conditions. Practitioners and patients alike attest to its benefits when it comes to relieving pain, reducing inflammation, increasing energy, and enhancing the function of the immune system. The research on PEMF is still in its infancy, but it is believed to encourage and enhance healthy cell growth, restoring damaged tissues. Essentially, everything works on a principle of magnetism and electrical activity, and this is nowhere more apparent than in the cellular functions of your body. Your brain, for instance, is little more than a means of conducting electrical impulses. And all cellular activity depends on electricity and magnetism. PEMF therapy works with your body to enhance electrical activity, delivering myriad health benefits. You know that DNA (deoxyribonucleic acid) is what makes you who you are. Unless you have an identical twin, no one else in the world has the same DNA as you. DNA also regulates cellular replication and renewal, and research has shown that DNA is also lined to low-intensity, pulsed magnetic fields. But DNA doesn’t work on its own. It operates in conjunction with RNA (ribonucleic acid), which, like DNA, is present in every living cell. The DNA sends instructions to the RNA, and together they work to effect protein synthesis in your body. DNA conducts electrons in order to communicate with the RNA. It sounds complicated, but what it means in the final analysis is that the flow of electrons may be linked with changing magnetic fields. PMEF stimulates the communication among cells, and the replication of those cells, by enhancing the magnetic field and the cellular communication. The entire process is improved by PEMF therapy, and tissues regenerate more quickly. Various studies back up this theory, indicating that bones, cartilage, blood vessels, muscles, nerves, and various tissues respond favorably to PEMF stimulation. Pulsed Eelctromagnetic Field Therapy (PEMF) is a reparative and restorative technology that stimulates cellular charge resulting in cellular repair. Those in the medical field who use PEMF in their practices believe it is the most advanced injury and pain management technology in the world today that has changed the future of natural medicine. Many scientific studies have been conducted to test the effectiveness of PEMF. Application of pulsed electro-magnetic energy is based on more than 40 years of worldwide research carried out by renowned scientists from Russia to United States. In addition, there are mountains of evidence of practical benefits documented by thousands of physicians around the world. Currently, in the USA, PEMF technology has been approved by the FDA for several applications, including bone fusion and bone density enhancement treatments for those recovering from compound fractures and those who experience old-age bone degeneration. Currently, we have entered an era where PEMF technology allows us to broadcast and deliver electromagnetic fields that charge our own cells into a state of homeostatic RESONANCE; strengthening the energy-field of each cell, thereby fortifying and protecting ourselves from pathogens that damage our body. It does so by recharging our 100 trillion cells, improving ATP production, increasing oxygenation, enhancing circulation, improving hydration, and gaining a better overall absorption of nutrients. Tens of thousands of patients have been treated successfully with PEMF for almost every condition including arthritis, neck and back pain, sciatica, sport injuries, post-operative healing, multiple sclerosis, Parkinson’s, Lyme, Fibromyalgia, Lupus, insomnia, depression, migraines, bone healing, osteoporosis, skin diseases and general pain. muscle aches and pains, headaches, nervous tension and stress, improving the immune system, regulating high blood pressure and degenerative conditions related to aging. PEMF is an FDA approved therapeutic technology which is non-invasive, non- pharmaceutical and an all-natural effective treatment for a variety of conditions because it promotes and maintains general cellular health and function. PEMF therapy devices use a computer/control unit to administer precise natural pulsating magnetic fields to the body (with specific frequencies and intensities) through various applicators such as a full body mat, localized pad applicators and rings to treat specific point on the body. It is fast and easy to use for pain management and recovery from sports injuries, lower back pain, muscle aches and pains, headaches, nervous tension and stress, improving the immune system, regulating high blood pressure and degenerative conditions related to aging. How Does PEMF Therapy Heal the Body? 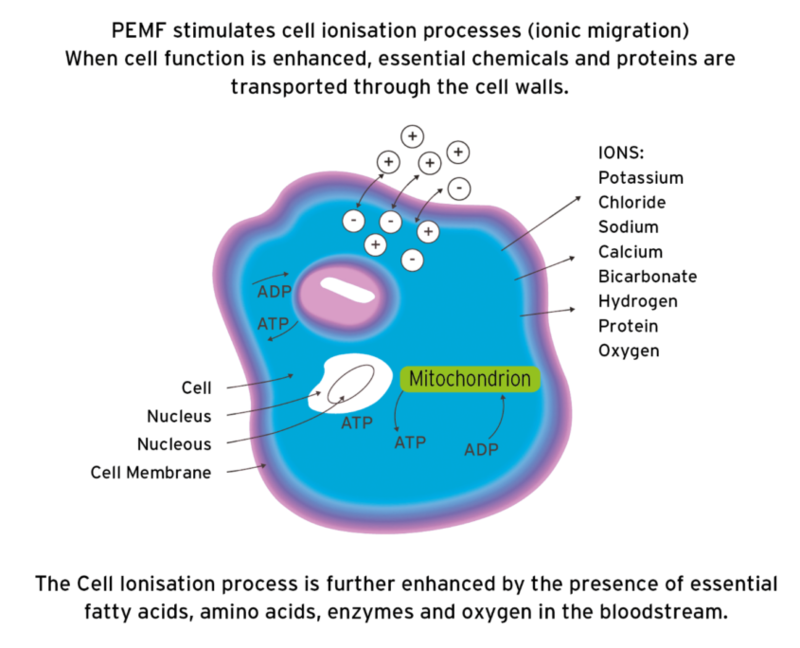 We can think of PEMF as a battery charger for our cells. The cell voltage in a healthy adults body is typically -20 to -25 millivolts. 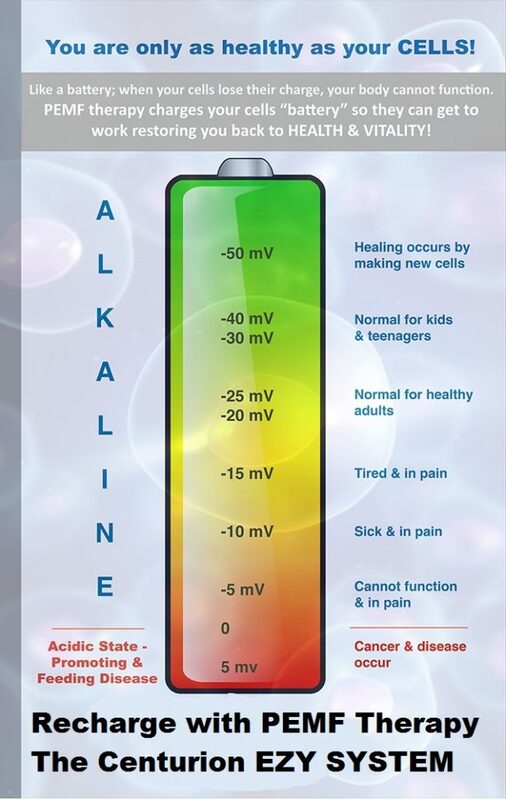 When our voltage drops below that level, chronic sickness and disease sets, our cells become dysfunctional and are unable to heal. By inducing an electrical magnetic current into damaged, low charged cells, PEMF therapy increases the voltage within the body to -50 mV, which is when cellular repair takes place. This in turn slows or stops the release of pain and inflammatory mediators, increases blood flow of the cells, and re-establishes normal cell regeneration. With the reproduction of new, younger cells, pain decreases, energy increases, and faster healing occurs. Pulsed Electromagnetic Field Therapy (PEMF) is FDA approved and commonly known to be used as a reparative technique in the field of orthopedics for the treatment of non-union fractures, failed fusions and depression. With over 40 years of clinical studies, researchers suggest that the pulsed signal in PEMF activates the body’s chemistry to heal more rapidly. You may have never heard of PEMF therapy, but it has been around since the days of Nikola Tesla who was the first modern individual to be recognized for manipulating electromagnetic fields for health purposes. PEMF Therapy had its first FDA approval back in 1979 but has been popularized in more recent years following NASA’s use in restoring bone and muscle to returning astronauts. What should I experience during a PEMF Session? You will not experience any pain during a PEMF session, but there is a distinctive pulsing sensation that one feels during their session. There are numerous types of therapeutic and intensity settings on the device, allowing the individual to increase or decrease its effects. Thus, a person can experience many different sensations. One of the benefits of our EZY System PEMF machine is that you are in control of your own treatment. Your technician will set the Pulse Per Second setting, but you will have access to control the intensity. You know better than anyone what “feels right” in your body and we want to insure you never experience any discomfort during any PEMF sessions. Who can use PEMF Therapy? Everyone can use PEMF therapy from the very young to the elderly, from sedentary individuals to those who exercise daily. Essentially, anyone at any age group, at any level of wellness or fitness, including both humans and animals (of all species), can use this technology. Who should not use PEMF Therapy? Those with pacemakers and those who are pregnant in 4th Trimester or at risk for epileptic seizures should not use PEMF therapy. How often can I use PEMF Therapy? Since it is non-invasive and non-pharmacological treatment, PEMF therapy is a safe, effective, and easy to use treatment modality. Using PEMF according to a suggested schedule will only benefit you as it mobilizes and empowers your body’s natural healing resources. At the level of tissues, the same 0-30 Hz frequency range has been shown to have the most positive benefits on the human body. 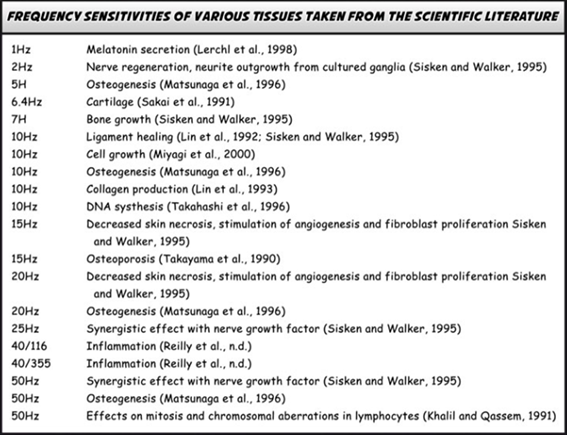 The Table to the left lists frequencies in the 0-30 Hz that biomedical researchers are finding that are effective for jump starting healing in a variety of soft and hard tissues. In 1995, Siskin & Walker noted that an ELF of 2Hz stimulated nerve regeneration, and a frequency of 7Hz can be used to stimulate bone growth. Frequencies of 10Hz promotes ligament healing, and 15, 20, and 72Hz may be used to decrease skin necrosis and stimulate capillary formation. Since tissues and organs are made of cells this research further confirms the hypothesis that the human body needs, resonates and responds to the 0-30 Hz range of frequencies. If you look at a compass under high magnification, you will see that it vibrates and fluctuates. The earth’s magnetic field is not a constant magnetic field like a bar magnet, but varies with time and it has a measurable frequency just like the Schumann resonance from the Ionosphere. Compelling evidence of the earth’s geomagnetic frequencies is found in Klaus Piontzik’s book, “The Lattice Structure of the Earth’s Magnetic Fields” whereby Piontzik lays out a derivation of the fundamental frequency of the earth’s magnetic grid. Using Fourier analysis and geomagnetic data from 200 measuring stations around the world, Klaus has discovered that the earth’s magnetic field has an oscillating structure with source points coming from four poles (not just two). That is, the earth is a quasi-quadruple. His model shows that several of the popular energy grids (the basis for lay-lines in dowsing) such as the Hartman grid, Curry grid, and others are actually harmonics within the earth’s actual geomagnetic field and its frequencies (see image to the left). The earth’s magnetic field is MORE than just a static or DC (direct current) field; it has a frequency harmonic as well. This frequency was found by Piontzik to be 11.79 Hz at the poles and 11.75 Hz at the equator. The difference coming from the fact that the Earth “bulges” at the equator due to centrifugal forces of its rotation. So the earths magnetic field itself has a fundamental frequency and that frequency is 11.79 Hz (polar) and 11.75 (equatorial). And like the Schumann frequency, it too has higher harmonics which at the Pole Radius are 11.79 Hz, 16.67 Hz, 23.58 Hz. and 30.80 Hz. Nikola Tesla also measured the frequency of the earth to be around 12 Hz and based some of his free energy devices on this frequency.  It is important to note that the primary frequencies and harmonics for both the Schuman and geomagnetic frequencies lie within 0-30 Hz. As we’ll see, this 0-30 Hz is the primary window of frequencies that the earth emits and also that the human body, mind and cells resonate to which is one of the main points on this website.